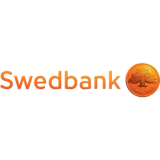 Swedbank is the bank for many people, households and businesses. As a leading bank in its home markets of Sweden, Estonia, Latvia and Lithuania, Swedbank offers a wide selection of financial services and products. We are looking for more employees who shares our values - open, simple and caring - and want to contribute to enabling people, businesses and society to grow. If you have ambition and share our attitude, you will find many challenges here. At Swedbank you have possibilities to grow. It is your drive and commitment that determines how you develop.